The name Drum Workshop is known for many widely distributed drumming products including drums, hardware, instructional and entertainment DVDs and more recently, the online drumming source, Drum Channel. Historically, though, DW got its start by making hardware back in the ‘70s (more specifically introducing a new design for a height-adjustable, trap-case seat and a refined design of the Camco 5000 nylon strap bass drum pedal). Along with the DW SSC drum kit that was reviewed by us not too long ago, a complement of 9000-series hardware products were included, and we decided to give the package its individual attention for players seeking some of the finest hardware available. We tested a 9000 Series Single Bass Drum Pedal, Hi-hat Stand, Heavy Duty Snare Stand, Heavy Duty Double Tom Stand, Heavy Duty Single Tom and Cymbal Combo Stand, Heavy Duty Straight-Boom Cymbal Stand, and Tripod Drum Throne. Though the hardware is both heavy and expensive, there is no denying that (for the most part) it is decently well made, with a lot of thought put into the design of many of its separate components. 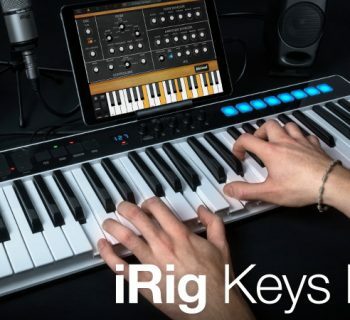 If you’re a working drummer looking to “invest” in your career by having gear that will last a lifetime, whether you are in a local band or on a major tour, these are definitely products that you should check out. DW9000 Single Drum PedalOf all of DW’s hardware, it is very difficult to deny their specific reputation for their bass drum pedals. In fact, we feel that it is safe to say that DW really got its initial fame from this one particular product. The 9000 Series Single Drum Pedal boasts a lot of features most certainly worth mentioning. Aside from the free-floating rotor-drive system, the pedal boasts an Infinitely Adjustable Cam that allows for wide adjustments in feel. Also included is the a Floating Swivel Spring that essentially economizes the response of the pedal. 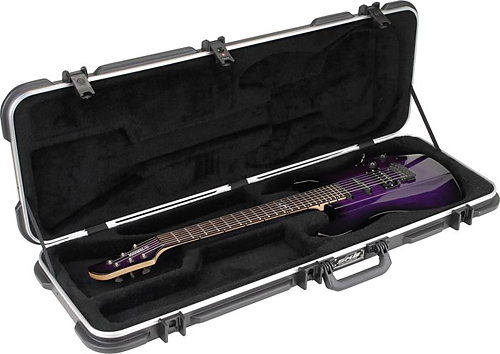 Other features include the ability to convert the pedal between chain drive and nylon strap (also an issue of playability), and the pedal package is accompanied by a clip, drum key, and a nylon travel bag. The 9300 Series Snare Stand had a surprising amount of unique features, which we felt were incredibly useful and thought out. With the modern craze of double bass drumming and considerable innovative use of multi-pedal kit configurations (a la Terry Bozzio), compromise of tom, cymbal and stand placement has become more and more of an issue. Also, let’s not forget your standard bar gig where the stage barely allows the room to comfortably play a four piece kit. The 9300 stand features an offset basket, which allows for more flexibility in snare drum positioning. Also addressing the very prevalent issue of snare drum angle slippage, this snare stand has a double locking capability with its Large Reset and TeckLock handles. Two other great features include the Plastic Tube Insulators (also featured on much of DW’s other hardware), which prevent the stand from rattling during recording, and the Knurled Snare Basket Knob that allows for a wide accommodation of snare drum sizes. 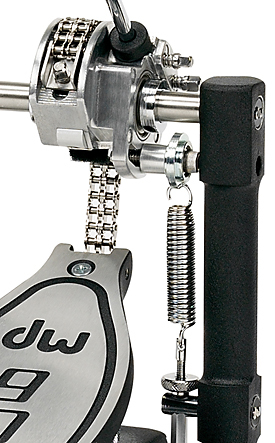 As far as a hi-hat stand, we were sent the 9500D three-legged stand, which most notably included a very interesting chain design that DW has titled its Double Eccentric Cam. The feature is meant to increase the sensitivity of the footboard. Coupled with the cam is the Infinitely Adjustable Locking Spring Tension feature that allows for a wide range of settings. 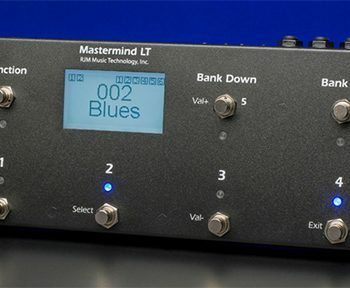 This is especially useful when considering that different playing situations require vast changes in volume (that can be easier to achieve with different tensions) as well as the more recent use of drastically varying hi-hats (size and weight), requiring a stand that helps you control your sound. The remaining features of this stand could be described as things not so much seen, but greatly appreciated. For flexibility of set up, the upper exposed part of the hi-hat’s rod comes in two lengths. The stand’s clutch has the bottom washer outfitted with a small tension rod that allows for consistent top cymbal tension. 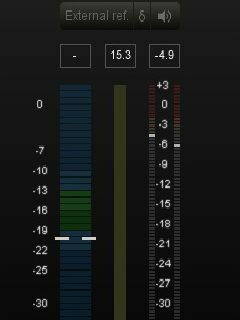 This can be such a blessing when considering that a lot of modern music has most drummers really laying into their hi-hats that can easily come undone as a result. Giving the bottom cymbal some attention, the Lateral Cymbal Seat is something that we have never seen before and really enjoyed. So often, the bottom hi-hat cymbal tilter is so much of a pain to deal with. On many occasions, they get stuck or are hard to reach given the surrounding equipment. However, here a drummer can adjust the angle of their bottom cymbal as easily as they would the tension on their crash cymbal. Moving towards the bottom of the stand, the swiveling legs allow for more freedom of set up with regards to other pedals (clave, slave double pedals, etc.) and the uni-body Folding Footboard allows for more secure compact cartage. The 9700 straight/boom cymbal stand came outfitted with a large number of memory clamps located at the tube joint, cymbal arm and tripod legs. Considering that these stands are the ones which require the most amount of maneuverability to accommodate a given shell configuration, all of these clamps assist in quick, care-free set up and take down. Also included is DW’s patented Cymbal Seat Adjustment that allows for a wide range of cymbal movement. While each of these features are great, the real joy of working with these stands is the TechLock design outfitted on a lot of the hardware. Coupled with the stand’s Toothless Tilter, not only do cymbals now have a wide variety of angles but the days of using a pair of sticks to unfasten a setting are gone (working drummers will definitely know what we’re taking about). Too often, to ensure a stable position, washers are over-tightened, and they eventually strip. Also, depending on the desired angle of the cymbal, adjustment can become a nuisance. However, 9700 adjustments are made with a press of a button and an easy twist of a handle. We felt that this was such a fantastic idea (to not have to sprain one’s wrist to adjust an angle). DW9000 Combination Single Tom and Cymbal StandThe 9999 Combination Single Tom/Cymbal Stand and 9900 Double Tom Stand came outfitted with a lot of the same features as the boom cymbal stands with a couple of additions. As far as the tom mounts are concerned, the hardware uses a ball-and-socket adjustment, which we felt was the only way to go, specifically because of the ease in mobility. Another great addition resides in the Auxiliary Clamp, which allows for additional arms to be added, therefore allowing for further customization of set up. On a side note, this would also help with being able to add extra gear without taking up too much extra space. The 9100M Workhorse Throne came preassembled with the exception of the seat being attached to the throne’s base. Though it is difficult to get around the fact that a drum chair is just that and not exactly your typical choice when discussing a source of innovation, DW applies its approach to the improvement of design to this piece as well. Most importantly to an instrumentalist that spends all of his/her time sitting down, the double braced seat is made with a foam combination with the intent of comfort and stability. Two other included features are the Double Locking Clamp (new to the 9000 Series), which is designed for consistent and quick height setting as well as the Vice Lock Seat Clamp, which is meant to keep the seat stable. Out of box, the kick drum pedal felt great, though it did take a little getting used to. In our prior experiences, a lot of kick pedals lacked the smoothness and sensitive response displayed by this pedal. Thus, it felt a little odd at first. However, once we became more accustomed to its abilities, it was smooth sailing. The hi-hat pedal felt just as good. The cymbal and tom stands felt very secure/stable though we felt that the company’s choice of felt was a little stiff. The snare stand worked really well and could cater to many different set-up configurations. And, the choice of rubber used on the basket was really great. It was very forgiving and would do a good job protecting a boutique snare, for example. One notable critique regarding the drum throne: we felt that the Vice Lock did not maintain stability as well as it should have considering the fact that we needed to re-tighten it rather firmly, rather frequently. The movement was not horrendous or extreme, but noticeable nonetheless. Not only do DW products come with basic instructions (for those who might not yet be familiar), but for those who need supplemental/additional information regarding the maintenance and functioning of the equipment, downloadable versions of the manuals are available from the company’s website. The DW CP9000PB Single Bass Drum Pedal (MSRP $494.99) can be found in most retail stores in the range of $250-300 or so. 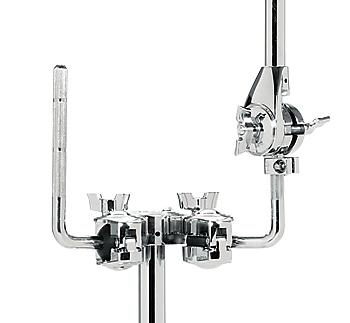 The DW CP9500D Hi-Hat Stand (MSRP $474.99) sells for close to $285. The DW CP9300 Snare Stand (MSRP $208.99) sells for close to$125. The DW CP9900 Double Tom Stand (MSRP $233.99) can be found for $135. The DW CP9999 Single Tom and Cymbal Stand (MSRP $324.99) is typically priced under $200. The DW CP9700 Straight/Boom Cymbal Stand (MSRP $249.99) sells for close to $150. The DW CP9100M Tripod Throne (MSRP $283.99) is often priced at $169. Though these prices aren’t cheap, you do get some rock-solid hardware with worthwhile features.